The Bonobo (Pan paniscus), sometimes called the Pygmy Chimpanzee, is one of the two species comprising the genus Pan; both members of that genus are technically "chimpanzees", though the term is frequently used to refer only to the other member of the genus, Pan troglodytes, the Common Chimpanzee. Bonobos diverged from Common Chimpanzees after the last Common Chimpanzee ancestor diverged from its last common ancestor with humans. Since no species other than ourselves have survived from the human line of that branching, Bonobos and Common Chimpanzees are our closest living relatives, sharing approximately 98.4% of their DNA with us. They communicate through primarily vocal means, in a language that has not yet been deciphered; however, we do understand some of their natural hand gestures, such as their invitation to play. 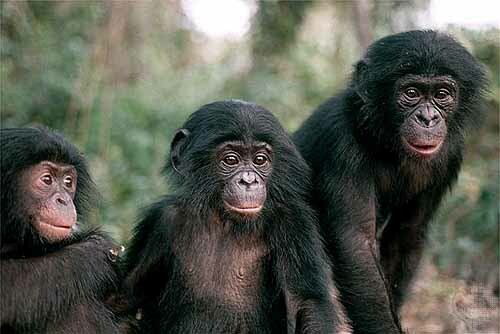 Bonobos are found only in the Congo River basin of central Africa. 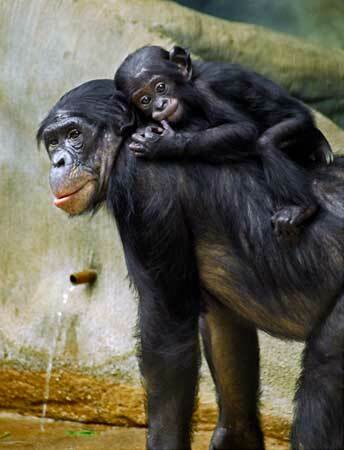 Size— Chimps and bonobos are about the same size, but bonobos are more slender and have smaller heads and smaller ears. Food— Chimpanzees eat plant material as well as monkeys and other mammals when they have the chance. Bonobos eat leaves, stems, fruits, worms,insects, and sometimes small fish. Location— Bonobos are found only in a small part of one country in Africa, the Democratic Republic of Congo (formerly Zaire). The four subspecies of “common” chimps range from western to central Africa. Getting Along— When trouble comes between common chimps, they often fight it out. They are also very protective of their territory and will kill chimps from another group, called a troop, if they try to move in. Bonobos don’t seem to have established territories, and they tend to handle any squabbles or tension by using different sexual behaviors instead of aggression.